Loftus Hall has a bad track record when it comes to hosting company. According to legend, it is haunted by the ghost of a girl who went mad there when she discovered the handsome young houseguest who caught her eye was really Satan himself—but that will have to keep for a different movie. This film shot on location in the County Wexford manse is all about the supernatural entities below that control the lives of the teenage residents. 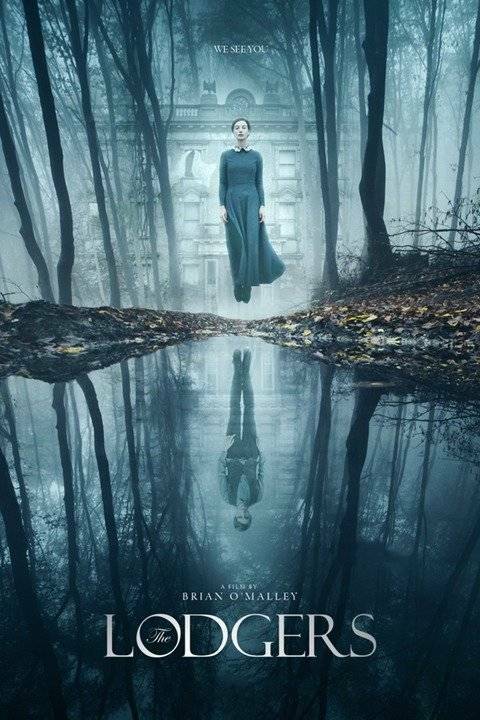 Twins Rachel and Edward (we dare not speak their family name) are caught in a tragic cycle, paying for the depravities of their sinful ancestors in Brian O’Malley’s The Lodgers (trailer here), which opens this Friday in select cities. Rachel and Edward’s parents committed suicide. Apparently, it runs in the family. Unfortunately, they are not alone. A malevolent force comes out after midnight to claim nocturnal dominion over the spooky mansion. The twins must abide by their three rules: be tucked into bed by midnight, never allow a stranger to cross the threshold, and never be gone for long. Obviously, this is bad for their social development, but Rachel still manages to start a haltingly flirtatious relationship with Sean, a decent lad who recently returned from WWI with a relatively mild case of PTSD. Rachel meets Sean just as she starts to question whether she should obediently accept her fate, like her badly stunted brother. To further destabilize matters, the sleazy family solicitor Mr. Bermingham starts coming around, pestering Rachel to allow him to sell the property, in order to get them out from under their mounting debts. Plus, Dessie, the local bully constantly targets Rachel, because she is vulnerable and Sean, because he fought with the British. The Lodgers is a deliciously atmospheric gothic yarn in the tradition of J. Sheridan Le Fanu, with some luridness cribbed from V.C. Andrews thrown in for extra salaciousness. Loftus Hall is definitely a sinister setting—it is hard to imagine anyone ever living there comfortably. Location is half the battle in a film like this, but Charlotte Vega is terrific as Rachel. There is also something surprisingly poignant about the tentative romance percolating between her and Eugene Simon’s Sean, as two underdog outsiders. Bill Milner is suitably creepy and clammy as the soul-ravaged Edward, while David Bradley looks like he might have ambled in from a Hammer Horror movie as dissipated old Bermingham. Written by David Turpin, a composer and literature professor, The Lodgers is clearly engaging with the gothic tradition. However, it also challenges traditional Irish prejudices, with respect to landowners and the British. (Many will find the hostility unleashed against Sean rather shocking, but remember, Ireland maintained formal neutrality during WWII as well.) 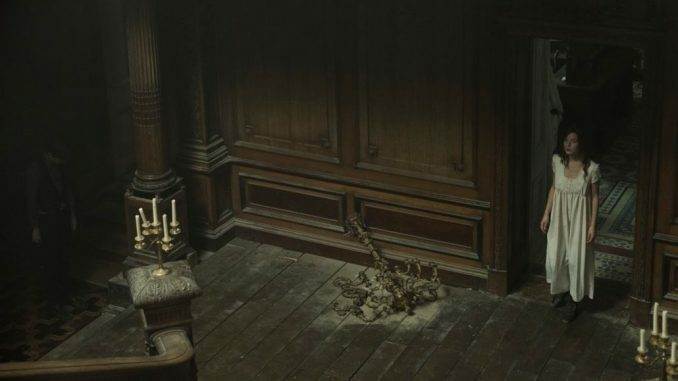 Like the best of gothic chillers, it is more about the sustained mood of foreboding (which O’Malley maintains quite surehandedly) than jump scares or gross-out moments. Recommended for fans of the genre, The Lodgers opens this Friday (2/23) in New York, at the Village East.